As the world’s population becomes increasingly urbanised, it is estimated that the number of journeys measured in passenger-kilometres will triple by 2050. Roads simply can’t absorb this increase. Railways, with their greater capacity for carrying more people, quickly and with greater energy efficiency, are the best bet to become our mobility backbone. Of course, engineers’ imaginations have created many alternatives to the original steel-on-steel approach to the railway. Maglev and the much-publicised but so far theoretical Hyperloop are often regarded as the ones to watch – but do they really represent the future of rail travel? Magnetic levitation (maglev) uses powerful magnets to propel the train along dedicated lines that are as straight as possible. The attractive forces between electronically controlled electromagnets in the vehicle and the ferromagnetic guide rails pull the vehicle up, while additional guidance magnets keep it laterally on track. This version of the technology was developed in Germany and is currently used to link Shanghai airport with the city centre at speeds of 430kph (267mph). However it’s perhaps Japan that is most associated with maglev. The nation that established the modern era of high-speed trains is also attempting to define the next chapter. Superconducting magnetic levitation (SCMaglev) has been in development for decades but was recently approved to run from Tokyo to Osaka from 2027, when it will complete the 500km (311 mile) journey in just over an hour. Unlike the Transrapid system in Shanghai, the Japanese maglev principle uses more powerful “superconducting” magnets and a guideway design based on repulsive rather than attractive forces. But while maglev is technically possible, its commercial viability is questionable. There is an extremely high initial infrastructure cost – Japan’s SCMaglev line is expected to cost ¥9 trillion (US$72 billion. It also cannot be integrated with existing rail networks and has a phenomenal energy demand, during both construction and operation. This casts serious doubts about maglev’s true potential as an alternative to conventional high-speed technology. Hyperloop is an elegant idea: travelling seamlessly at 1,220kph (that’s right, 760mph – just under the speed of sound) in gracefully designed pods that arrive as often as every 30 seconds is very appealing. The concept is based around very straight tubes with a partial vacuum applied under the pods. These pods have an electric compressor fan on their nose which actively transfers high-pressure air from the front to the rear, creating an air cushion once a linear electric motor has launched the pod. All this would be battery and solar powered. Technically it’s a challenging design, although if someone can make it happen it’s the man who proposed the idea, Elon Musk, the man behind SpaceX and Tesla. However, Hyperloop is not rail travel. It is, as Musk puts it, a fifth mode of transport (after trains, cars, boats and planes). It’s designed to link Los Angeles to San Francisco; cities hundreds of miles apart that can be connected in an almost straight line over a relative flat landscape. This simply isn’t an option in much of the world. 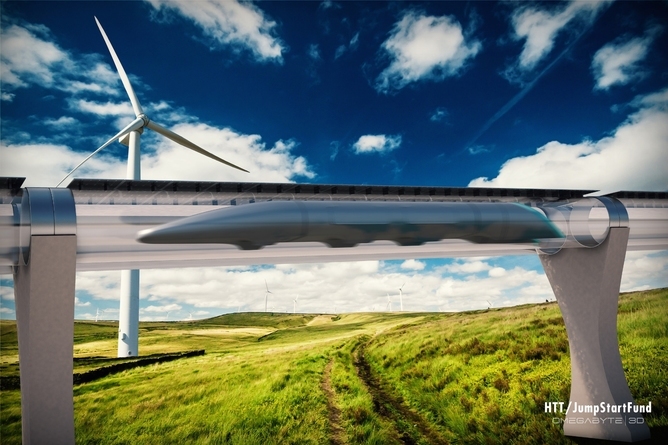 Ultimately, if Hyperloop happens at all it will be a stand-alone system. It’s no substitute for rail. In practice, the vast majority of us will continue to travel on trains that are not dissimilar to those that are around today. The UK is about to take delivery of 122 trains that will be the workhorses of most intercity travel for decades to come. They could still be in service come 2050, albeit following several refurbishments. Greater automation are expected to dominate not just rail but all types of travel. Automatic train operation is already used in some urban railways which allows for shorter distances between trains on the same line. It is anticipated that in the future all mainline trains will be able to communicate with each other, meaning significantly more trains on the track, increasing capacity and service levels. This in turn will make physical line-side signalling equipment redundant, leading to more simple layouts for new lines. Better use of energy on electrically powered intercity rail travel will likely play a significant role. For instance, energy storage systems and advanced substations will allow a shift to smarter rail systems. Future predictions are to be treated with caution. But state-of-the-art railway investment around the globe is still largely based on the steel-on-steel principle of trains on tracks. And there’s no reason to doubt that this will be the define future of rail travel in coming decades – just as it has done since the birth of rail nearly 200 years ago. Roberto Palacin is Senior research associate, Railway Systems Research Group at Newcastle University.